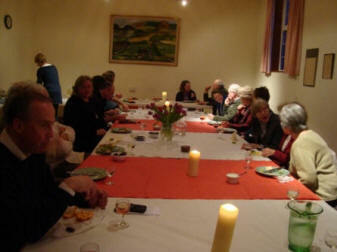 'The Last Supper' a simple meal followed by reflection on the events in the Upper Room. Middle Eastern background music. There is one large table. 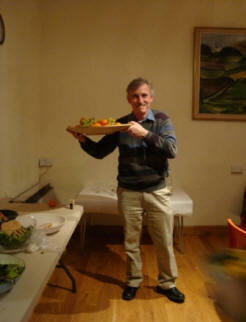 As guests arrive their hands are washed in a large bowl and dried by the clergy. Then a simple meal is served trying to use authentic ingredients where possible. The Gospel story is retold with several voices taking part. and the evening finishes with a short reflection.